Ever since you were a child you've dreamed about shooting webs from your wrists. Well, the good news is that you don't need to be Spiderman to realize this dream! We've created something even better! With a Webcaster Gun, the webs won't come from your wrist, but the gun itself! Let's be honest, shooting webs out of your wrist would be kind of icky - right? This webcaster gun gives you the same effect without giving you the heebie jeebies just thinking about where those webs came from. To use this webcaster, just load, point, and shoot to create the perfect spider web. Plus, the refills come in multiple colors so you can create a spooky and fun look like no other! 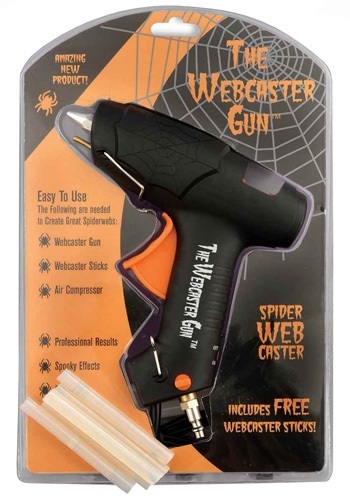 This webcaster gun comes with everything you need to get great looking spider webs in your home our outside this Halloween. The kit comes with the webcaster gun as well as several web caster sticks to get you started. All you'll need to get the fun started is an air compressor. Once attached, you'll be on your way to a truly spooky Halloween!